One day after Carter Students competed in various science competitions the school erupted in anywhere from 7 to 10 fights triggering a whole school lock down, a mosh pit, a student stole a police car, fire alarm was pulled and as you see from the video above a Security Officer was assaulted on campus. Parents picking up kids at other schools were texting their kids telling them to stay away from the trouble and get out safely. Since Carter has opened it has been the school that seems to have a large collection of problems. Last year the former Principal Mrs Foote told us that she was having a lot of issues with fights and sexual promiscuity. Years ago these problems were laid at the feet of Eisenhower and Rialto High Schools but now it seems the problems have come to rest at Carter. 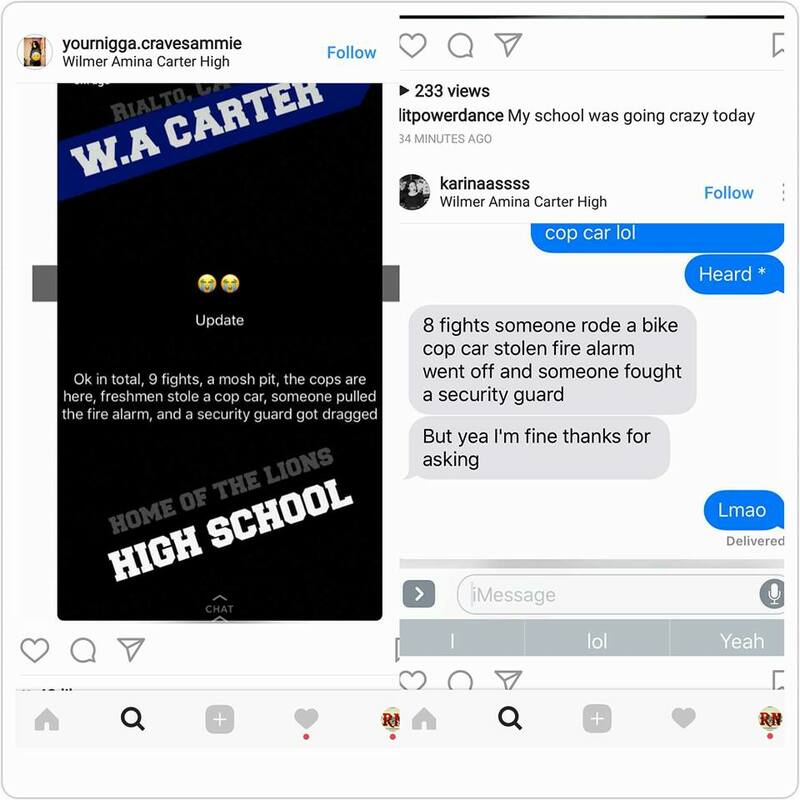 Social Media Expert and former Executive Director of Inland Valley Drug Free Coalition David Phillips says just search the hashtag Carter High School and see what the student body is being exposed to. Sexual behavior videos, marketing of drugs and fights are being pumped into the kids eyes. The old saying garbage in garbage out applies here. If we continue to dump our kids in a well of sewage should we be surprised with this outcome? After our editor spoke to Sydea Jafri the District Communications Director we found out that most of the social media made things seem worse than they really were. A few fights between four girls was a bulk of what occurred today on Carters campus. The RUSD Security Officer in the video above was not seriously injured. Also Mrs Jafri and Rialto PD personnel confirmed that no police car was stolen by a student today. What occurred according to Mrs Jafri was a couple of cops running along a RPD unit being driven by an officer. Some were concerned with the amount of Law Enforcement on scene if nothing bigger happened, but it seems that the response was just part of an abundance of cation and officer safety. Trash parents raise trash kids.